American tenor, Jonathan Winell, won second prize for his touching version of “Che gelida manina” from Puccini’s La Bohème. What made his rendition notable was his genteel avoidance of the usual tenor melodrama. The end result was a convergence of dramatic sincerity and vocal brilliance. The greatest hero [of the preliminary round] was an American tenor, high C’s knight, Jonathan Winell, who electrified audiences [singing Ah! mes amis…pour mon âme]. He pulled out those 9 C’s effortlessly and boldly and managed to hold the last note splendidly for a long time. His singing was easy and strong, and his high range opened in surprisingly bright, rich overtones. Jonathan Winell, a tenor, sang sweetly as Cleón. Jonathan Winell sang “Comfort Ye” and Every Valley” beautifully and with gorgeous tone. His “He that Dwelleth in Heaven” and “Thou Shalt Break Them” were both powerful and beautiful. Major kudos. Tenor Jonathan Winell sang “Salut Demeure” from Gounod's Faust with introspective restraint, and he hit a lovely high C at the finale. Jonathan Winell made an impressive debut, his bright high notes surprisingly relaxed while he consistently displayed remarkable power. Jonathan Winell as Alméric (the king's armor-bearer) made a strong, well-characterized contribution. A series of splendid “Highlights” from Puccini's Gianni Schicchi followed with...Jonathan Winell, tenor. Mr. Winell's winning singing of “Firenze è come un albero fiorito” with its stratospheric tessitura was exciting. 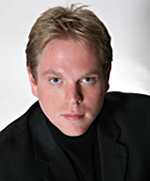 Jonathan Winell is a tenor with excellent projection, good breath control, smooth delivery and a warmth in his singing that promises major roles in his future career.